This issue contains articles about action against detention centres, anti-racist action, migrant/refugee support centres, experiences from Greece, AF’s pre-Brexit viewpoint, and more. The ‘migrant crisis’, the referendum about withdrawing from the EU, and many conflicts past and present are all about artificial lines that divide groups of people. These borders are both physical – you are not allowed to cross from one piece of land to another – and mental and imaginary – the idea that people of one side of the line are fundamentally different from those of the other side. 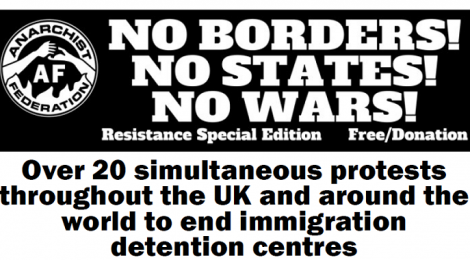 In this issue of Resistance we focus on the borders between nation states. Governments have control over a particular patch of land that is perceived to have some kind of common social and cultural identity. The fact that humans have been migrants around the globe for thousands of years seems to be forgotten as the nation creates this illusion of sameness in a group of people that live within its borders. The state certainly doesn’t treat all those people with equal respect! As anarchists we reject all borders except the border between the vast majority of the world’s population and the ruling class – the bosses, the bankers, the property developers and all those with the wealth and power to exploit and oppress us. The ruling class doesn’t respect the boundaries that they impose on us: money goes all over the world for speculation and tax evasion, corporations move production from one country to another in search of the lowest wages, and shops are filled with products made on the other side of the world. Inside the nation, they have erected borders on our land, excluding us from more and more places. Land has long been largely privately owned in the countryside, vast Highland estates, for example, and agriculture. But increasingly in the cities, land is being privatised and effectively excluding anyone who isn’t working or spending money. In this issue of Resistance, we look at the fightback against borders and the ways in which people are creating a spirit of internationalism and unity between the working class against the ruling class.